Health Information Exchange – An Overview of Policy and Implementation Issues. What health centers need to know in considering HIE. This is a lot of material, so I’ll cover it in two columns. This first column will focus on current policy, what information is exchanged and the policy aspects of HIE implementation. The second column will explain some of the technical aspects of HIE implementation, the policy/reality gap and what health centers need to know. Taken as a whole, these three columns are intended to provide a good introduction to health centers for making decisions about HIE. – Reporting to patient registries for quality improvement, public reporting, etc. To ensure that a full record is available, meeting these goals will require HIE if patients get care from multiple health care organizations, CHCs, hospitals etc. and their ‘health care team’ is located in several different places. 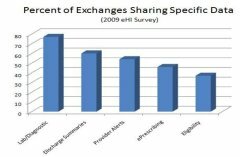 Several recent studies have looked at the information that is shared in Regional Health Information Organizations (RHIOs) (and exchanges. A group led by Adler-Milstein at Harvard found that over 80 percent of the RHIOs they surveyed exchanged lab and test results, while approximately 70 percent exchanged medication histories and patient demographic/clinical data (mainly inpatient discharge summaries). This was consistent with the findings of the 2008 eHealth Initiative (eHI) survey that additionally found that 40-50 percent of the exchanges surveyed exchanged eligibility, enrollment and referral data while about 25 percent exchanged medical alerts. The following figure shows the data that was exchanged. In addition, 67 percent provided access to electronic health care records (EHRs). The 2009 eHI survey reports 32 community and/or public health clinics are included in the organizations that are exchanging data. 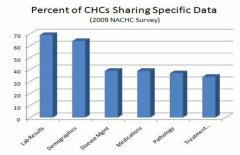 In terms of CHCs sharing data, the 2008 NACHC HIT Adoption Survey found that only 20 percent of CHCs share data electronically (i.e. through a computer network, not by fax, etc. ), and of that 20 percent only 35 percent share data through an RHIO or an exchange (7 percent overall). The data most often shared, according to the NACHC survey, is shown in the following chart. Adler-Milstein points out that this level of HIE is far from the “widely held vision of comprehensive data exchange”, it appears as if a small percentage of CHCs are sharing substantive clinical data through exchanges (see figure below). There are several levels we have to look at to understand how HIE is actually achieved. The first is within an individual health center or health center network. The second is exchange among separate providers, usually limited to those located in a single region. Finally, there is exchange among provider organizations across regional boundaries. Within each of these levels are the additional specific foci on the structural organization and process of exchange, and the technology of exchange. In terms of organizational issues and process, health centers need to focus on what process is used within an exchange to select and deploy technology. What actually happens from a process point of view at this level is that an RHIO, HCCN or exchange selects a set of vendors to provide software and integration of data. These vendors have products or product sets that will include at least an integration engine, a registry or directory and a front-end portal. Often the vendor will also provide a generic practice management system and an EHR as part of the product set. These product sets are installed in each of the provider organizations so that information sharing is enabled. A health center must start with an infrastructure that is able to support these products and a staff that is capable of doing initial troubleshooting and maintenance tasks. Technically, each level has an overarching design that technologists call architecture. It’s the picture of what software exists and how it is hooked together or integrated. At the health center level, this design consists of the separate applications that are used – applications such as practice management, EHR, accounting and general ledger, etc. These applications may be integrated to share information so that, for instance, diagnosis and billing codes from the EHR are used by the practice management system in claims submission. (I covered this type of exchange in my March 2008 column, Integration and Interoperability for HIT ). In the next column, I’ll explain HIE implementation and deployment in a little more technical detail. I’ll also discuss the gaps between policy and the reality on the ground, and some of the technical (and non-technical) issues for health centers moving to HIE. Finally, I’ll briefly list the very real advantages for health center participation in HIE.